You’ll have to forgive the anachronism of this recipe. It’s been wafting around my draft folder for months, but with one baby and another, I just never got around to publishing it. So even though summer has spread its steamy cloak over all of us, I hope you’ll remember this recipe the first time you wish you had brought a sweater with you. Melt coconut oil in a large heavy pot. Add onions and cook on medium low heat until they are translucent. Add the garlic and cardamom seeds, stirring until fragrant- about 45 seconds. Increase the heat to medium high and add the apple and carrot. Saute until they are softened and there is a nice crust on the bottom of the pan. Deglaze the pan by adding the vinegar and scraping up all the brown bits. Add 1 quart of the stock , the cinnamon, the lemongrass, and the bay leaves. While waiting for that to boil, scoop the cooled squash flesh out of the shell and add to the pot. Once boiling, reduce the heat and simmer for 10 to 15 minutes to allow the flavors to meld and vegetables to completely soften. Remove from heat and use a stick blender to puree the soup. Take your time with this step. There’s few things as culinarily undesirable as finding chunks in your soup that look as if they’ve already been half chewed. 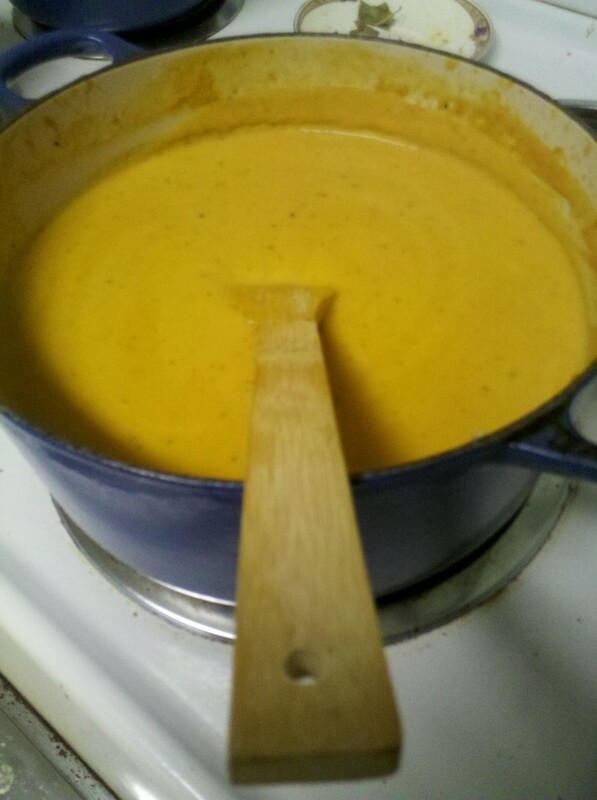 (If you don’t have a stick blender, carefully pour the soup into a bar blender and puree in batches. Then return to the pot.) The soup will likely be very thick, about the consistency of mashed potatoes. Use the reserved stock to thin it to your desired consistency. Return the pot to the stove and reheat if necessary. Just before serving, stir in the heavy cream. Garnish with Greek yogurt and chopped dried apples. *Look for it at Asian grocery stores. Or, if you live in Columbia, pick some up at City Roots. 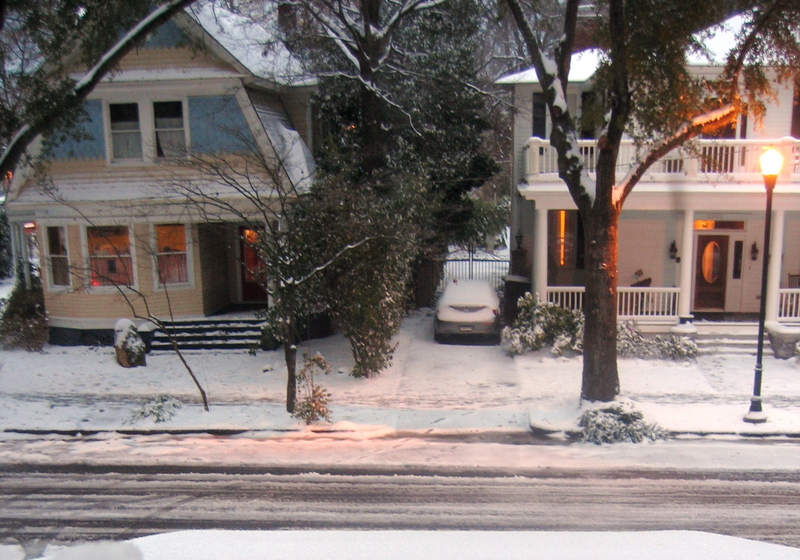 The weather here has shown an uncharacteristic propensity for white this winter. While she often indulges in her love for the sparkly white of frosts, she usually only dons the honest-to-God white stuff every four or five years. This season, which isn’t over yet, she has waltzed out in the swirly white dress no less than twice. While I fully intended to make the trek to the farm, it seems that pregnant scooter-riding farmers get a snow day. With the unexpected day off, my thoughts turned to good snow day activities. I was having trouble staying warm… it seems Hemingway is taking all my body heat too. So, instead of going all the way outside, we did our snow activities from the window. 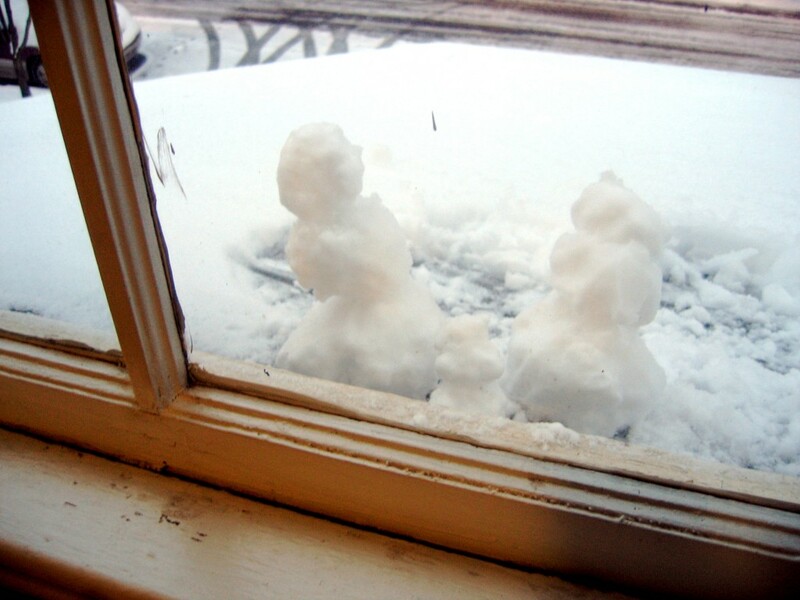 While Mr. Quotidian held the window open, I leaned out and made our snow avatars. A tall snowman in Mr. Quotidian’s likeness was easy enough, but I had trouble with the pregnant snowife. So, as a compromise, I fashioned a little Hemingway snowman separately. 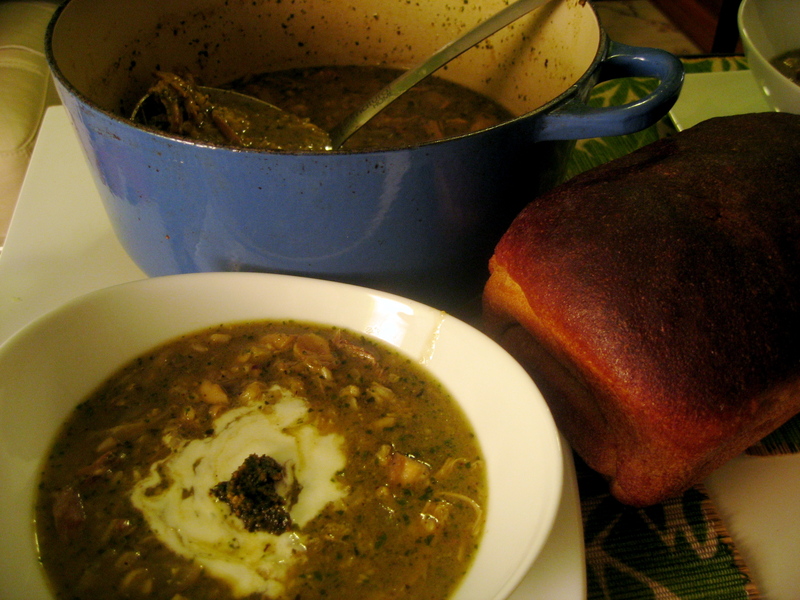 Nothing could be more of a soup day than a snow day, so I turned my attention towards dinner. For me, soup must include two things if it’s to be classified as a snow day soup. It must be based on real broth that has been simmering all day, and it must not require any ingredients other than what’s already in my fridge, freezer, or pantry. (Extra points for being able to use leftovers.) The requirements, though they might seem random, actually have some reason behind them. The on-hand ingredients stipulation is for the obvious reason that on a snow day you either can’t or don’t want to make the journey to the grocery store. The broth specification has to do with the anticipation factor. Snow days typically involve long stints under blankets punctuated by brief stints of outdoor frivolity. When I’m home all day, there’s something about slowly becoming aware of the aroma of stock simmering on the stove, attending it throughout the day, and then enjoying the rewards at the end of the day. That pleasure is compounded when my hands are cold from snow and they slowly thaw as I stir the stock, leaning next to a warm stove. Obviously these aren’t real conditions and don’t absolutely have to be followed to have a successful soup. 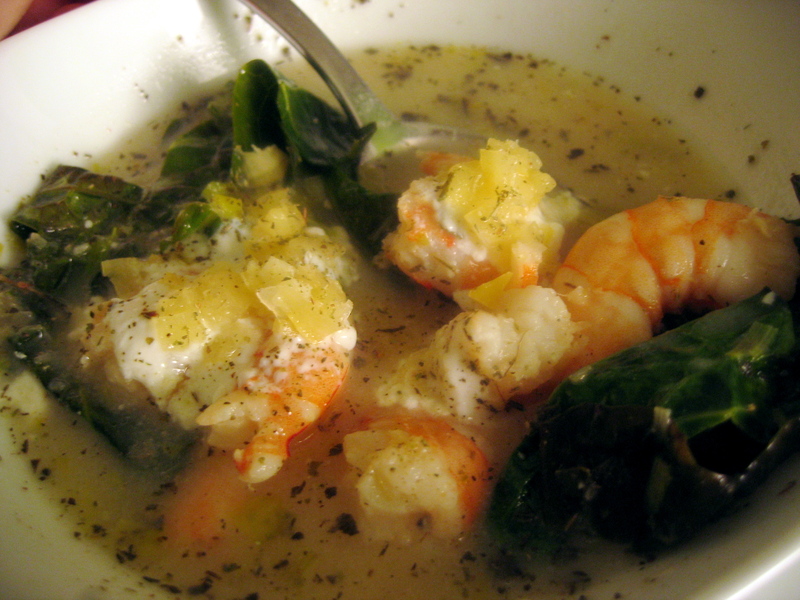 For me, they are just what distinguishes a Snow Day Soup from any other run of the mill soup. I just happened to have a leftover whole chicken and some rice from last week that was practically begging to be made into soup. In the morning, I picked all the meat from the bones and set the stock to simmer. Later that evening, I sauteed some onions and garlic and stole a few ladle-fuls of the stock, leaving the rest to simmer overnight. I also added a bit of leftover whey to up the protein content (pregnant you know). Because I had time to spare, I added what I consider one of the secret weapons of a good soup: a Parmesan rind. These take awhile to melt in, but can’t be outdone in the savoriness and body they add to soup. When the rind was melted, I added the cooked rice and shredded chicken. Then, at the last minute to preserve its color, I added a couple spoonfuls of homemade pesto. Perfect. Even though I hadn’t been out playing in the snow all day, this soup bore the same sense of comfort and well-being that a hot meal did after my childhood snow days. With this soup, the weather can wear white all she likes. In a medium pot, melt the butter. When is sizzles, add the onions and garlic with a pinch of salt. Stir to coat them with the butter. Let them cook until they start to soften. Add the broth and cheese rind. Bring to a boil, reduce heat to a simmer, cover the pot, and let simmer until the rind is melted into the stock. If you have a few stubborn bits that refuse to melt, just fish them out. Add the chicken and rice and cook till heated through. Right before serving, add the pesto. If you add it too far in advance, it will loose its vibrant green. Taste and season with salt and pepper. Serve with a swirl of yogurt and a dollop of extra pesto. One of the snags people often get caught in when eating a local diet is the ebb and flow of specific foods. First, most foods are not in season year round. They come and go like the tide. They might be obtainable, but you have to travel far to get them. Second, when they are available, they are available in the same way that a tidal wave is available. Lettuce is one of those foods. Somewhere along the line, it acquired the status of poster child for healthy eating. People on diets opt for the salad bar instead of fried chicken. Health nuts get bragging rights based on how many salads they eat. Prewashed, mixed, and bagged lettuce is a staple of busy moms trying to feed their family more vegetables. And then there’s me. I think I eat fairly healthfully. And yet, for most of the year, salads (at least those made from lettuce) are conspicuously absent from my table. In the south, where I live, the lettuce season is very short- from about March to mid April, and then again in September. Lettuces thrive in cooler spring and fall temperatures. The intense heat that other sun bathing vegetables like tomatoes adore, exhausts lettuces. But in the spring, before the days get too hot, lettuce comes rolling in from the garden and crashes in waves over farmer’s market stands. It is vibrant green (or red, or purple), succulent, tender, and without a trace of bitterness. 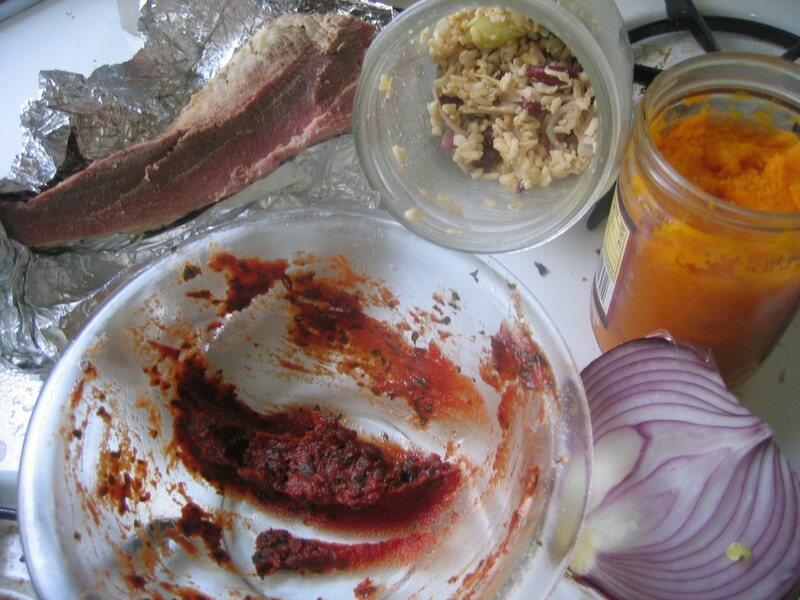 Leftovers are the problem child of the kitchen. They throw tantrums and fall all over the floor when forced to share space in the fridge. They stubbornly refuse to go away and seem to bring out the worst in other family members forced to coexist with them. Clearly, something needs to be done about them. While simply reheating that leftover enchilada or half serving of peas is certainly an option, I prefer to disguise my leftovers as soup. Depending on your perspective, this is either a creative and frugal way to reuse ingredients or a shady practice that comes dangerously close to being dishonest. I am loyal to the first camp, but must admit that some of my leftover soups have made me feel mildly criminal, as they tasted like I just dumped all my disparate leftovers into a pot of broth and called it soup. 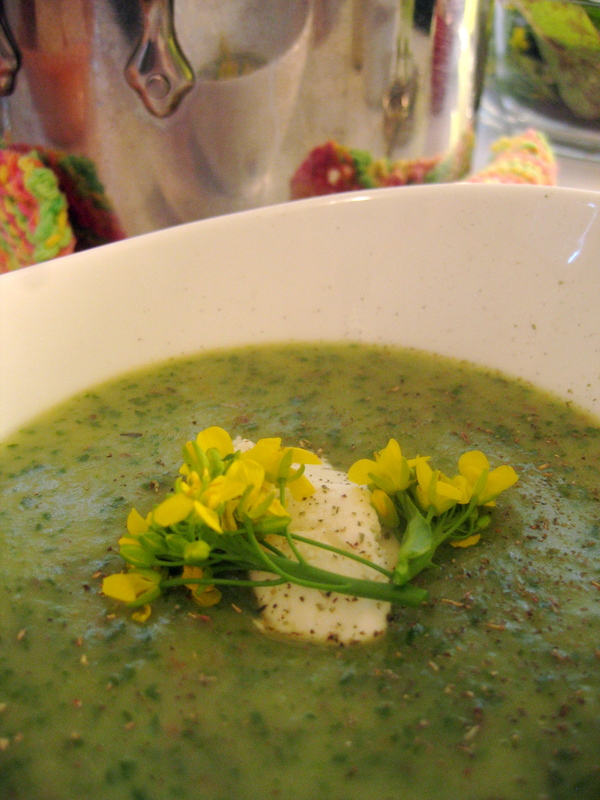 I felt like Snow White while making this soup. While I hummed about the kitchen, ingredients seemed to wing out of the fridge and into the soup as if little adorable doe eyed woodland creatures were helping them along. Before I knew it, I had a beautiful soup that seemed to have created itself.